This volume is based on a detailed analysis of change in the law and in the administration of justice affecting juvenile off enders in California in the fifties and sixties. It addresses how procedural law develops on a long-term basis and under what conditions. It also examines the processes by which revolutionary changes occur in law and the extent to which social change can be directed or controlled by legislation. Social action to revise California's juvenile court law, which had remained little changed since 1915, began in 1958. Subsequently a small group of legal reformers who perceived anomalies in the law and in the underlying philosophy of the court overcame substantial resistance to effect revolutionary revisions of the law. Lemert examines their experience to determine how changes of such magnitude could take place after decades of gradual adaptations in the juvenile courts. His study also looks into the consequences of this change on the court and related agencies of law enforcement. The author sets forth a socio-legal theory of change-a conception of paradigms, normal evolution, and revolution in law. He applies this theory to data, with special attention to the resistance to legal change and the processes by which it gives way to the adaptive process of normal law. Lemert discusses the substantive aspects of juvenile law as it relates to human affect and meaning, touching on the existential elements of justice. 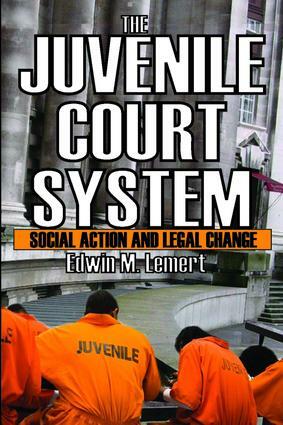 Professionals dealing with juveniles, legal scholars, sociologists, and political scientists will find this book, with its emphasis on how to achieve more equitable administration of juvenile justice, has much to contribute to our understanding of the dynamics of social change.